Megan Kerins and Alejandra Castrodad-Rodríguez of the Rocky Mountain Institute (RMI) describe a new microgrid toolkit to ensure power reliability for those most vulnerable in Puerto Rico. When the lights went out September 20, 2017, no one could have foreseen that it would take 130 days to restore power to seven out of ten people in Puerto Rico. Throughout the restoration process, Puerto Rico continued to experience sustained, widespread blackouts that left many in the dark for days at a time and highlighted the fragility of the repairs to the electrical grid. Perhaps even more notable than the magnitude of Hurricane Maria’s overall impact was how the unequal distribution of vulnerability to these systemic shocks impacted the recovery of communities following landfall. To become better informed about how to address these inequities, the nonprofit organization Resilient Power Puerto Rico, in partnership with RMI, is developing the Renewable Energy Toolkit. 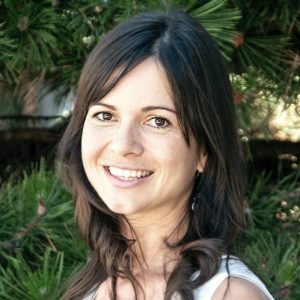 The Toolkit is an interactive application that aims to strengthen collaborators’ ability to implement renewable microgrids in Puerto Rico, ranging from community groups interested in installing a microgrid, to donors seeking to prioritize resource allocation and maximize the impact of their investments. 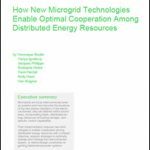 Microgrids are a powerful tool to address the unequal distribution of vulnerability because they reduce exposure to prolonged power outages, ensure the continuity of critical infrastructure, and strengthen adaptive capacity. With poverty rates three times those of the mainland United States, Puerto Rico faces significant challenges related to satisfying basic needs, such as housing, health, and food. As a small island in the Caribbean, Puerto Rico is at the frontline of climate-related hazards, including sea level rise, increased high-intensity hurricanes, and prolonged droughts — made worse by aged infrastructure. In our efforts to facilitate access to the resources necessary for the development of microgrids in Puerto Rico’s most underserved communities, we asked ourselves: Who is most susceptible to impact when these hazards occur? How can we maximize the social impact of our actions? What can we do to ensure we are addressing the unique barriers faced by the islands’ most vulnerable communities and groups? Answering these questions is critical to the Renewable Microgrid Program’s mission: To support community energy needs, increase local control of energy resources, and provide continued access to energy to satisfy critical loads. Our team started the Renewable Energy Toolkit by producing robust datasets to understand how communities located throughout Puerto Rico are exposed to and adapt to natural hazards. The Renewable Microgrid Program (RMP) Team created three remarkable datasets documenting the post-Maria power restoration process over time and space, and showing which areas face multiple hazards. These datasets lay the foundation for the Toolkit, an interactive app that operates by overlaying risk data with georeferenced socioeconomic data that measures factors that affect sensitivity to natural hazards, such as income, level of education, dependent population, and access to essential services. The Toolkit also includes geospatial data on adaptation factors, including access to major roads and essential services. Combined with the spatial distribution of energy recovery, we will be able to systematically develop approaches that explicitly address acute underlying inequities. The post-Maria energy restoration data reveals an additional level of inequity. The power restoration curve, shown above, was generated using 641 entries from sources such as Puerto Rico Electric Power Authority (PREPA) press and social media, US Department of Energy Situation Reports, the government of Puerto Rico’s status.pr webpage, and official press releases by government officials. Using this data, we were able to chart the critical milestones of power restoration, some of which include the more than 40 percent of consumers entering the New Year without power and the nearly six months needed to restore power for the final 30 percent of consumers. 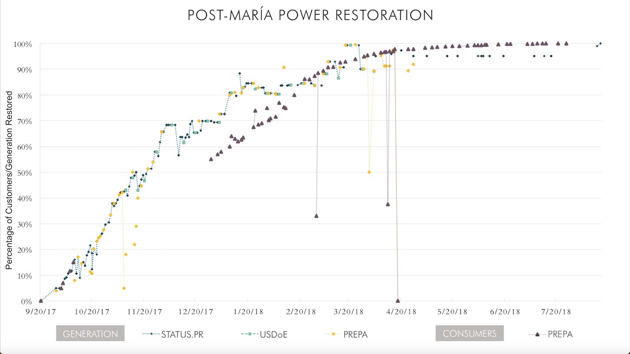 Seeking to understand the geographic distribution of the restoration process, the RMP team also mapped the restoration of power at the barrio and sector levels for the final 30 percent of consumers, using PREPA’s tweets from day 130 (after Maria’s landfall) onwards. The results revealed that, in many cases, the longest restoration times were faced by the most underserved communities, including communities like Vieques, many of which remain disconnected from the grid and are still running on generators today. The results of this work will directly influence how we proceed in future microgrid implementation efforts and will be fundamental to maximizing the impact of such investments. We believe distributed approaches can be the most effective way to address inequity issues as we move forward with our efforts to build energy resilience. Renewable microgrids are one such approach. In the most exposed communities that suffered the greatest damage, distributed systems reduce exposure to prolonged power outages through independence from the centralized grid. For example, a microgrid installed in Adjuntas and Daguao Center powered lights and medical devices during the bleak months without power and during the blackouts that followed. In communities such as these, where infrastructure is fundamental for day-to-day life, microgrids reduce susceptibility because power redundancies ensure the continuity of operations in critical places such as medical facilities, community centers, schools, and emergency service centers. In these same communities, where restoration took the longest, microgrids strengthen adaptive capacity because they are locally controlled. Local control over resources reduces both the time to restore power after an outage and potentially the cost of electricity during normal times, thus freeing up scarce resources to build more equitable and sustainable communities. Building on the insights gained from this tool, we are working collaboratively to establish processes that will facilitate access to capital for organizations in vulnerable communities and provide technical expertise for microgrid development, through the Renewable Microgrid Program. This Program will support knowledge exchange, funding, and procurement to maximize microgrid investments’ impact and magnify communities’ voices. In future versions of the Renewable Energy Toolkit, communities will be able to create their own solar microgrid proposals and advocate to support these efforts. Given the urgency to create a resilient power system in Puerto Rico, we believe that rapid deployment of microgrids is needed. It is also essential that local organizations are empowered to design, implement, and continue projects sustainably. If you would like to support these efforts toward energy resilience in Puerto Rico or connect with our ongoing work, please contact Megan Kerins at mkerins@rmi.org to learn more. Megan Kerins is an RMI senior associate, islands and electricity. Alejandra Castrodad-Rodriguez is on the operations team of Resilient Power Puerto Rico. This blog originated on RMI Outlet and was reposted with permission. Unmoored from Facts: Is the EIA Looking at the Same Energy Markets as the Rest of Us?